In his new book Becoming Worldly Saints, Wittmer means to answer this question: Can you serve Jesus and still enjoy your life? Is it possible for you to be fully committed to the Lord and still find time to enjoy life’s pleasures? Or, as some seem to feel, do we need to live lives of utter frugality, sending all our money to the mission field? Are we responsible to share the gospel with absolutely every person we encounter? Should we really feel that constant low-grade guilt that accuses us that we are not doing enough for the Lord? In short, how do we resolve the tension between the pleasures of earth and the purpose of heaven? Wittmer’s answers are as compelling as any I’ve read. His concern is that in all the good things we do for the Lord, we forget the importance of being human and enjoying God’s good creation. “Our lives will shrivel if we allow our passion for redemption to smother the pleasures of creation. Being a Christian must not become an obstacle to being human. But the problem is even worse in reverse: When we eliminate our earthly pleasures, we inevitably limit the reach of our heavenly purpose. If we want to attract people to Jesus, our lives must be attractive.” We, of all people, ought to enjoy this world and display our love of life. Our temptation is to make a harsh distinction between loving the Lord and loving the world he has made. However, “Our love for Jesus and his world is not a zero sum game. Attention given to creation is not stolen from its Creator. The more we enjoy God’s gifts for their own sake, the more we can appreciate him. And thank him for, and love with him. … Thank God for the privilege of being human and of being here. Then go have some fun.” Go and have some fun and trust that God enjoys your fun as much as you do. Wittmer structures the book around the story of Scripture—the great work God is doing in this world, which proceeds under the familiar headings of Creation, Fall, and Redemption. He shows that God created this world so we could enjoy it and that he still expects that we will find enjoyment in it. He corrects those people who live only for tomorrow, as if the pleasures of this world are meaningless. He shows that our responsibility in this world is to love God, serve our neighbor, cultivate the earth, and rest, and that we need to maintain a balance between these. He shows that the tension we feel is an inevitable result of man’s fall into sin, and he attempts to bring peace between the urgency of the gospel and the demands of being human. In every case he succeeds well. 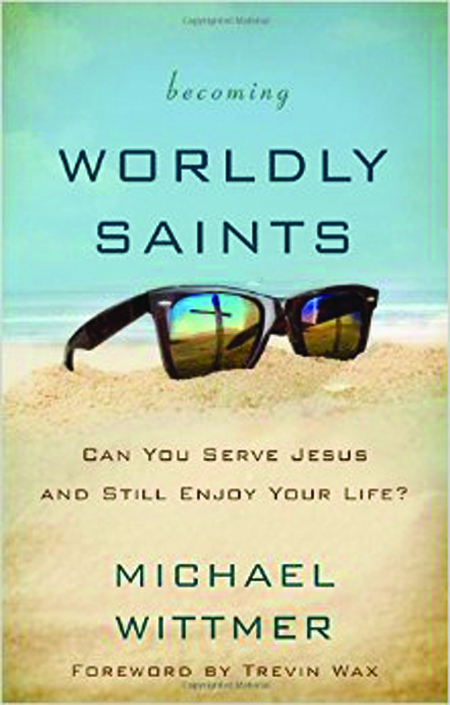 Becoming Worldly Saints was a joy and a relief to read. Grounded firmly in Scripture and in the best of Christian tradition, it offers a powerful and compelling vision of the Christian life that is equally exciting and attainable. This isn’t settling for a lesser vision of the Christian life—this is living out what the Bible says. Becoming Worldly Saints is availabl on Amazon.com.